QUESTION: Why do you still advise the billionaires? ANSWER: There is good and bad in every group. I seriously doubt that the NY Investment Bankers will sign up for anything under their name at least. The NY crowd has preyed upon pension funds and governments to say the least. They created the mortgage back scandal, wiped out many countries, bribed their way into Washington, and are the cause behind the rise in taxes and the Sovereign Debt Crisis. I promised I would not abandon the little guy. But at the same time, if you ever expect to make a difference when it counts, you have to help those who also have the ability to pick-up the phone in a crisis and perhaps help in a dark hour time of need against the bankers to save the day or else they will win and you lose everything. There are not that many individual “billionaires” out there lining their pockets on the backs of the poor. That is typically those in government and the Investment Bankers in NYC. The vast amount of institutional clients are managing individual money not trading with other people’s money as the bankers do. They are the targets typically of the bankers. What was described in Smith’s book was real. You know it was real but all the press who tried to support Goldman. 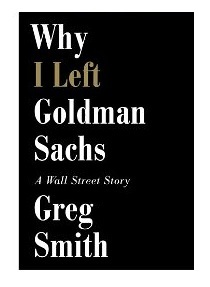 What Smith described was not unique to Goldman. This is the culture that dominates NYC. So advising the typical victims of the NY crowd is necessary.